I don’t wanna sound like I’m kissing your ***, but I will: just want to say my respect for you skyrocketed after I saw you replying the comments. People always say you and the band are down to earth, it’s true. How many rock stars take the time for this ???!!! and come to Brazil for a gig in S�o Paulo, we’re dying to see you here. The Brazilian AB board has over 1,100 members! great you’re answering peoples comments! And so cool you’re sharing your baseball stories with all of us! And also many thanks for using one of the pictures I took on ur first post, I guess u know how much I love both Alter Bridge and Baseball! haha..
Also I hope you like the photographs I’ve given you at the glasgow show back in june! p.s. Keep on rockin and say hi to the others! Hey Mark, I never thought that AB would give Baltimore a visit for the tour. You guys are great for being so approachable, waiting and freezing my *** off was so worth it to meet you and Myles. Keep on rockin’ and never spend too much time away from your son, otherwise, you’ll guys end up strangers under the same roof. Its not fun, trust me, love, peace, and taco grease. Hey Mark, I love what you’re doing here. Great stuff. You are such an influence on so many people, including me…so thanks. My wife and I have seen you on tour 4 times already (and were fortunate enough to spend time with you in Des Moines) and look forward to the next time you’re in the Minneapolis area. Who were your favorite players growing up and who are your favorites now? BTW, nice job in the Celebrity All-Star Game. Wow! I took that picture at Beloit Riverfest! Isn’t it the best? The crowd was already throwing up the horns and you guys hadn’t even played one note! Thanks for all the time you have taken to hang out with us (The Fans) you’ve always been good to my crew! Brian and I do Full Tremonti.com together, so thanks for the props on that! Hey Mark, This is awesome! I love hearing all your stories! Keep ‘um coming! Congrats on the new baby!! Although I am not yet a parent, I hear it is wonderful! Thank you for all you do for us fans, you rock! hey Mark. what’s up man? i had to post a comment in the end because the ping pong comment was pretty funny. i’d also challenge you purely for comedy value coz i wouldnt have a hope in **** of winning. but pool… and on an english table.. that could well be a different story on a good day. winner gets your charcoal PRS. loser admits Myles’s superiority. sounds fair eh? lol. Hey Mark! I’m curious about your workout regimen, how do you keep those guns in shape? Like what type of lifts do you do, and how many repetitions and sets you do? ps. I saw Alter Bridge back in November here in Seattle and you guys ROCKED! Did you know Kim Thayil was there watching you guys? I saw him and was like WHOA. Hey Mark, it’s really neat reading the glimpses into the Mark outside of the AB role. Beloit rocked, and I can’t wait till Hot-Lanta with 3DD…yeah one band away from my ultimate concert line-up. Take care, enjoy fatherhood, and see ya next time. Hey Mark! Congrats on your baby boy! Sounds like you are enjoying fatherhood! I recently had my twin girls at the last of June. (I met you at the Little Rock concert.) They were pretty early but are finally out of the hospital and home now. So, it’s vomit, drool, and dirty diapers x 2. It’s all good! Take it easy and enjoy every moment that you have with him. They grow up way too fast! – Do you play the whole solo? The booklet mentions 3 solos on the song (Rich Ward, you and Rick Beato); We’re guessing you play the first half of the solo and after the finger tapping is someone else, but to be honest we really have no idea. Heh! That’s “just” it! Thanks! I’ll reply your forehand smash with my backhand drive. Anyway, I didn’t know you’re big baseball fan. I thought you’re big pingpong fan. I’d like to make guitar sound just like you do. (I always wanted.) Do you have any recommendation for guitar pedals that I can use? (I already got Morley Power Wah, And I think I need a distortion pedal that costs under 500bucks) Triple Rectifier is too expensive for me. First, excuse me for my english. I’m one of your best french fan and I went to your 2 last shows in Paris !! It was really awesome….I know that there wasn’t a lot of people but I really hope you will be back in Paris soon…to finish my post, just one question mark : why aren’t Creed and now Alter Bridge famous in France ? (like in UK..).I converted all of my friends with your music and I’m sure that your next shows in France would be great ! I saw Alter Bridge when you came through Atlanta back in April. Your cover of Kashmir was awesome. I noticed you have a new Danelectro guitar in your inventory; any chance you guys could cover “In My Time of Dying” when you come through in September? Looking forward to seeing Alter Bridge live again. You guys rock! Just when you think he doesn’t get any cooler, he goes and answers all of our comments. It was great to hear some songs that were completely your creation on ODR….when you’re songwriting, are visualizations ever evoked in your mind? Hey Mark, I’m a newish guitarist (i started about a year ago) and first off i wanna thank you deep down for providing so much inspiration to keep fuelling me…..really awesome stuff man. i have a couple of questions. Firstly are there any new guitarists who have impressed you recently? (i’m completely wowed by the guys from Trivium at the moment \m/). Also, are there any British bands that you like? (Muse and radiohead are among my favs)as we never seem to hear about bands breaking through in the U.S. Since you are friends with Mike Piazza. Did you ever hang out with him and Todd Zeile? Todd’s a good guy. Hi Mark, my name is Jacy and I’m 14. I have loved you ever since the beginning of Creed, and Alter Bridge is AMAZING! I’ve been lucky so far as to see you TWICE on the tour! Both times were awesome! 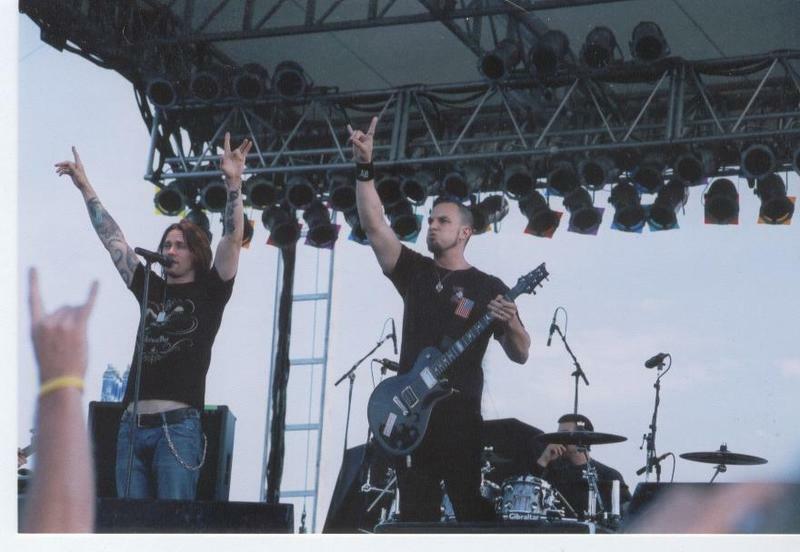 Anyway, I used to want to play guitar, but I just figured that I never would, and so I kind of left that idea alone especially after Creed ended..but then came Alter Bridge, and after April 16, 2005 when I saw y’all in Biloxi, MS, I was just like “WOW…” You inspired me soo much. My dad bought me a guitar, and I’ve been playing since. I just wanted to thank you, and especially thank you for introducing me to Submersed. They are awesome!! Well, good luck with your future endeavors and your baby. Hey I’m 14 and from Australia, me n my friends love you!! We know like all the words to all the song (alter bridge and creed), have all the cd’s even a weird dvd haha. When will you guys be in Aus? We would love it sooo much if you came out so get talking with myles,brian n flip.Well hope to see you sooner then later.xoxo.Isobel. hi mark my names daise ,im fron BRASIL and i love your work sice of creed you have agreat gift and i dont know english very well but i think that youre fantastic i hope watch the alter show some day(its my dream now)brasil isnt so far away usa so WHY YOU NEVER COMES HERE?i would go there if i had money but its like that phase”I WNNA BE POOR SOMEDAY CAUSE BE EVERY DAY IS HARDNESS!!!!! !ok some day i llgrow old and work but coould you look down(brasil)ok isnt one europe (and isnt same)but you have many fans here…beginig to me i think that you should send mails for your fans …TALKIN REAL NOW TRY PUT BRASIL IN YOUR NEXT TRN PLEAAAAAAAAAASE!!!!!! !I BEGGIN I AND THE OTHERS 20.000 OF COMMUNITY, ALIAS DO ONE ORKUT TO TALK WITH BRASILIANS FANS(BEGINING FOR ME AGAIN) AHHHHHHH BEFORE I FORGET THE MOST IMPORTANT”I LOVE YOU SO MUCH !!!!!!!!!!!! !AND MUCH!! Yo s� que para leer esta mensaje no va ser dificil. para ti e todos los integrantes de esta estupenda banda. Esta foto demuestra mucha la uni�n entre ustedes! Sensacional tu idea de mantener un contacto directo con los que realmente escuchan tus musicas e quieren saber de ustedes. Talvez un dia puedan venir a Brazil , es todo lo que queremos! Un gran abrazo, e mucha suerte! hi mark here im again now sad!!! cause i send the drow did many time for you site and til now nothing!!!! even you play just one time would be fantastic to us. i hope tou read it someday and see the drow !! !